Pirates have a reputation for being ruthless bloodthirsty killers and they certainly did get creative with the ways they offed people. Pirates also developed some strange habits that made them infamous, like wearing earrings and hiding treasure. Just like the Vikings created odd rituals, pirates used codes to govern their lives on the high sea. The pirate code was an agreement that marauders made with each other to establish a sort of law among the lawless. It ensured a certain amount of honor, like they could only fight their sailing mates on land. The informal pirate code also dictated pirate attire. Pirate traditions include myths about a single item that could protect men from drowning, the best reason to wear an eye patch, and the secret behind Blackbeard’s greatest trick. Keep reading to learn more about their bizarre ways of life. Pirate ships were outfitted with numerous cannons. Blackbeard’s Queen Anne’s Revenge, had a whopping forty. Those cannons were vital during combat when a pirate ship might need to sink an enemy to prevent capture. Cannonballs were accompanied by a loud blast, though, and were known to deafen. The crafty sea criminals would hang wads of wax from their earrings to prevent this sound damage. They popped the waxy contraptions into their ears like a makeshift earplug when firing cannons. In pirate society, two men could join into matelotage and share all their plunder, even receiving death benefits if one died before the other. 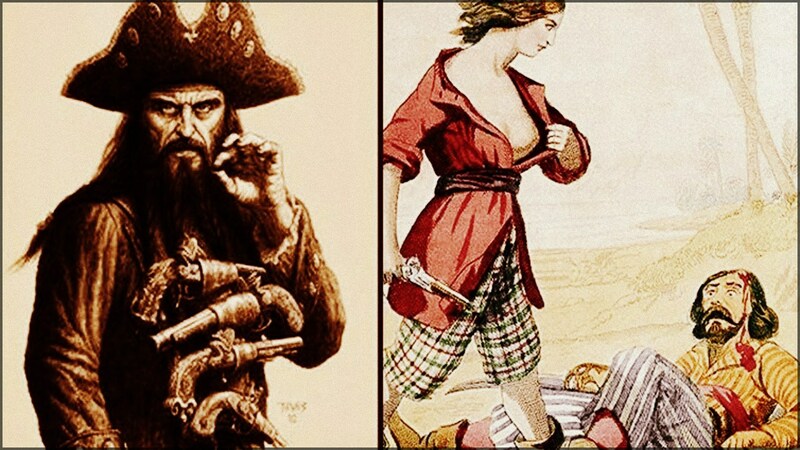 Pirate mates would live together, exchange gold rings, and sometimes even share female prostitutes. Pirates spent their lives on the high seas but they didn’t want to spend death at the bottom of an ocean (or Davy Jones’s Locker). The infamous piercings that pirates wore in their ears were actually insurance to make sure that they’d be given a proper burial. Whether gold or silver, the precious metal could be melted down and sold to pay for a casket and other funeral necessities even if a pirate’s dead body washed ashore. Some pirates went so far as to engrave the name of their home port on the inside of the earrings so that their bodies could be sent home for a proper burial. The Jolly Roger flag that flew from pirate masts was terrifying but the most dreaded sea flag was red. A ship hoisting a red flag warned its enemies that no mercy would be given to a captured ship; everyone on board would be killed immediately. The red flag was sometimes called the “Bloody Red” and if it replaced a skull and crossbones flag, the pirates under siege might sometimes jump ship. Born Edward Teach, Blackbeard was arguably the most terrifying pirate in the world and he built his reputation on hemp. In the early eighteenth century, Blackbeard captained the Queen Anne’s Revenge but before capturing that ship or any other he’d weave hemp into his long dark beard and under his captain hat. Once he lit the hemp on fire, smoke billowed out from his face and made his opponents fear for their lives. In addition to his burning beard, Blackbeard also wore a crimson coat and carried at least two swords, pistols, and knives at all times. Pirates haunted the seas since humans first invented boats and they’ve captured their share of famous hostages. In 75 BCE, pirates captured Julius Caesar but when they only asked for a ransom of 20 talents, Caesar laughed in their faces and told them he was worth at least 50. While he was held captive, Caesar serenaded the pirates with poetry. Once his ransom was paid, though, Caesar had the pirates crucified as punishment. Some pirates were definitely missing eyeballs; their ships were dangerous places, after all. But other pirates wore eye patches for different reasons. By wearing an eye patch, the sea buccaneers could always keep one eye adjusted to night vision. Pirates spent a lot of time going from the bright light above deck to the darkness below deck, especially when they were raiding ships or defending their own. If he lifted his patch before going below deck, a pirate could instantly see even if there was only a little light. Credit for the invention of grog goes to sailors in the British Navy, who first started making the drink some time in the 1600s. To avoid drinking slimy water contaminated with algae and microbes, the sailors mixed rum into their water. In 1731, the British Navy gave each sailor half a pint of rum per day; that was equivalent to over five shots of alcohol. Pirates borrowed the recipe for grog and made it legendary by adding lemon juice (it helped prevent scurvy) and sugar (it tasted good). Their’s was a drink that packed a punch. The earring might be the most famous piece of pirate jewelry; they were certainly very practical. The sea buccaneers were quite superstitious about the hoops, though, and there were many myths about the earrings’ otherworldly abilities. One tale claimed that they could prevent sea sickness while another suggested that the precious metals could cure bad eyesight. Many pirates believed that a gold earring could prevent a man from drowning but that myth was disproved a number of times. Even though it’s easy to picture a pirate burying treasure on a tropical island, only one pirate, William Kidd, was ever recorded as having buried treasure. Kidd deposited his loot off the coast of Long Island but the scheme backfired when an ally dug up the trove and used it as proof to convict Kidd of piracy. There’s a good reason why most pirates didn’t bury their treasure; most of their booty wasn’t gold and jewels. Pirates typically stole food, alcohol, and weapons, in addition to lumber, cloth, and animal hides – essentially, whatever ships might be carrying across the Atlantic. Those goods weren’t worth much in the ground so pirates used them immediately or sold them. Women also took to the seas to make their fortunes. One pair, Anne Bonny and Mary Read, sailed together on the pirate ship Revenge in 1720. Anne Bonny even served as first mate. Some, like Mary Read, chose to dress as men to hide their identities. While there is some evidence pirates did use walking the plank as a form of psychological torture, there is not enough evidence to prove it was a widespread practice. It became popular thanks to the rise of pirates in entertainment in the 19th Century. There were plenty of other ways pirates killed people, and some of it involved forms of torture. But for the most part, anyone they wanted to execute was killed quickly and swiftly. But the most common form of death-by-torture involved something much worse than a plank. It was called keelhauling, and it involved throwing the victim into the water underneath the boat. They would hoist him up on one side, passing him under the ship’s keel, and then place a large weight on his legs to make sure he stayed underwater. As if that wasn’t enough, the perpetrator then endured being pulled by the ship’s weight and drowned. If they were lucky, the blow from being thrust against the ship’s bottom would be enough to kill them. The Jolly Roger black flag with a skull and crossbones might be the best known pirate insignia but there are multiple versions of that banner. The first mention of the Jolly Roger came from the 1724 book, A General History of the Pyrates, by Charles Johnson. Blackbeard’s flag, for example, featured a skeleton toasting the devil while spearing a bleeding heart. Others had red skeletons, hourglasses, or even men standing on skulls. Pirates did actually maroon people on isolated land masses when they did something wrong. It was considered one of the worst ways to die, because it was slow. Typically those marooned were disgraced pirates who violated the rules of a ship. He would be placed on an isolated sandbar with just the clothes on his back, a small portion of water, and a weapon. Pirates who were marooned had the option to kill themselves with their weapon, but it was widely considered cowardly. Some men actually managed to survive being marooned if they were rescued by a different pirate crew, but that was very rare.